The five-year deal, which is retroactive to April 1, 2016, includes higher wage increases than the government initially offered. 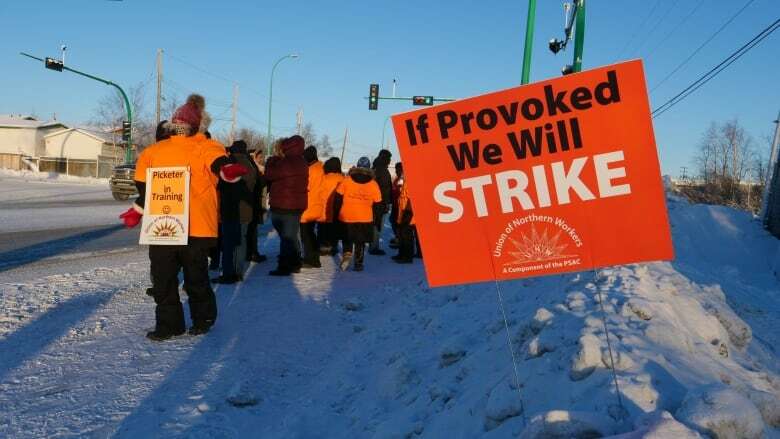 After a years-long dispute that nearly resulted in a general strike in February, the Northwest Territories government and the union representing about 4,000 of its employees have a new collective agreement. The five year deal, which is back-dated to April 1, 2016, incorporates the outcomes of binding arbitration and other elements agreed to by both parties, according to a government news release Monday afternoon. "We're pleased with the recommendations," said David Stewart, the territory's deputy minister of finance. "He's made some fair decisions... [that are] good for employees but also recognize our fiscal reality." "Negotiating a new collective agreement can be difficult under ideal conditions. The current fiscal and economic environment provided additional challenges," Finance Minister Robert C. McLeod stated in the release. "I would like to thank Vince Ready for his work in helping to resolve the outstanding issues." To avert a government-wide strike, the Union of Northern Workers and the territorial government agreed they would adopt as binding the recommendations of mediator Vince Ready. The government has now received Ready's report, and says it will follow up with the Union of Northern Workers to "discuss implementation of the new collective agreement." The union did not provide an interview on the agreement, but on Monday CBC obtained a memo on union letterhead addressed to its membership. It states "there are a couple of areas that the union needs clarification on," without saying what those areas are. The memo also stated that a general membership meeting would be held in the "coming weeks" to go over the agreement. At publication time, the CBC has not been able to confirm the authenticity of the memo with UNW leadership, but multiple union members confirmed receiving the memo. According to the press release, the deal has no wage increases for the first two years, but includes a retroactive 1.6 per cent increase dated April 1, 2018, followed by another 2.3 per cent hike effective April 1, 2019 and a 2.5 per cent increase in 2020. The government's previous wage offer included no increases for the first two years, followed by a 1.4 per cent increase in 2018 and 2019, and a 1.7 per cent increase in 2020. Employees will receive a lump sum payment to account for 2018's salary increase, though Stewart said the government was still determining how much each employee would receive and when they would receive it. Stewart also said the government would be reviewing how negotiations broke down to improve their process in two years time — the next time the collective agreement is up for discussion. "This has been a difficult process," said Stewart. "Hopefully we'll be back in a better place by the time we're ready to launch into the next round of negotiations." In his report, Ready says it would be an "understatement" to say negotiations were "challenging and, at times, contentious." He says both parties "worked diligently" during mediation to resolve their differences, but that talks stalled "mainly over certain job security issues, the term of the agreement and economic increases." An increase of $250 to the base of the Northern Allowance, as of April 1, 2018. The conversion of term employees to indeterminate after two years in the same job "in most circumstances." Three days of paid leave for employees experiencing domestic violence. Changes to parental leave to "support" employees that opt for the new extended parental leave option. An expansion to situations in which relief employees may be used. Changes to layoff provisions, including a memorandum of understanding on "voluntary separation," which allows employees to potentially opt for other options, such as early retirement, if their positions are eliminated or transferred to another community. A commitment to move toward instituting the National Standard for Psychological Health in the Workplace.